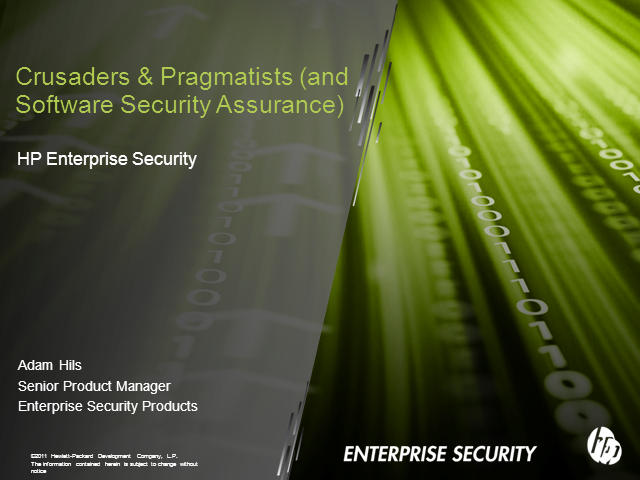 Historically, software security vendors and enterprise teams have been divided into two camps: The Crusaders, who embrace the 'true religion' of source code analysis as the holy grail and believe that they can achieve nirvana with solving problems completely at the code level; and the Pragmatists, who believe that the Crusaders are unrealistic idealists, and that dynamic analysis of staged web applications is the only practical way of addressing real, attackable vulnerabilities. The reality is that both camps are correct when placed within an overarching Software Security Assurance (SSA) framework. SSA creates a programmatic enterprise application security approach that incorporates both the source code Crusaders and the dynamic Pragmatists. This presentation will describe how the Crusaders and Pragmatists, placed within the SSA discipline, can work together to reinforce each other and bolster the entire security program’s ultimate goal – securing the enterprise. Automation is often seen as the key to increasing efficiency and improving compliance but automation is only as good as the people who make the rules. In this webinar we will look at the benefits and the pitfalls of trying to automate compliance with both the GDPR and associated regulations and why, in the early years of a new regulation, it is sometimes better to rely on People and Processes rather than technology. On the anniversary of GDPR, we will take a look at the current state of privacy and security, and dive into how organizations are addressing these challenges. Join this panel of experts to get the answer to all of your privacy, security and compliance questions. Since the rollout of The General Data Protection Regulation (GDPR) in 2018, companies worldwide have had to implement new policies and procedures to protect data. Join leading compliances and security experts as they discuss why data protection is at the heart of GDPR compliance. One year after GDPR, the presentation will explore whether the provisions introduced are sufficient to deal with the challenges of big data and algorithms. Ivana will present a clear roadmap for organisations deploying AI covering governance, privacy and ethics harms and algorithmic impact assessments. David Froud, Founder & Director, Core Concept Security Ltd.
All of these approaches are wrong, and regardless of the size/type of your organisation, the first steps were exactly the same; Go find your data. In this presentation we will simplify the process of achieving GDPR compliance so that anyone can get started. Find out what's trending in BrightTALK's IT Security community and the challenges keeping security professionals up at night. The research will be followed by a panel discussion with Scott Sinclair and SNIA cloud experts Alex McDonald, Michelle Tidwell, Mike Jochimsen and Eric Lakin. Ben Rothke | David Mundhenk | Jeff Hall | Arthur Cooper "Coop"
With hundreds of different requirements, the various Payment Card Industry (PCI) standards can be overwhelming. While the PCI Security Standards Council has provided lots of answers, the devil is often in the details. Our panelists are some of the top PCI QSA’s in the country, with decades of combined PCI and card processing experiences. They’ve seen it all: the good, bad and ugly; and lived to tell the tale. Join Ben Rothke, David Mundhenk, Arthur Cooper, and Jeff Hall for an interactive Q&A session, and get answers to your most vexing PCI questions. No PCI question is out of bounds. Tune into this session to learn how to determine if you have the right people with the sharpest skills defending your organization through the use of a Cyber Training Range. Learn what are Persistent Cyber Training Range Environments, the benefits and value of a Cyber Training Range and how they help you answer the question ARE WE READY TO DEFEND AGAINST THE NEXT ATTACK?". In this presentation we will give an overview of the current state of the power of an endpoint in the modern enterprise; and how modern advancements make the need for adversarial testing even more critical. While cyber attacks come from all directions, the majority of them originate on endpoints. In this webinar UJ Desai, Director of Product Management at Bitdefender will discuss why organizations are still struggling with endpoint security, and will explore the five critical elements of endpoint security that will allow organizations to effectively defend endpoints from both common and advanced cyber attacks. The largest threat of organisational breach occurs at the Endpoint level. Hacks, phishing, malware and untrained end users are a constant risk that need safeguards and monitoring to protect individuals and businesses with strong IT security. Small changes to your endpoints can drastically improve your protection. However, when you manage one or more businesses and need to implement and maintain these changes across multiple machines or environments, different complications will arise. Globalization and division of labor has allowed multi-national corporations and businesses to focus on their core capabilities while outsourcing all various ranges activities form legal services, IT services, marketing, etc... these trends will continue to gain speed as global markets become much more efficient. Proliferation of suppliers has also rapidly increased emerging threats such as privacy, data sharing and cyber risks. The key takeaway for audience in this presentation will be over all discussion of dimensions of supplier risks and how to holistically develop a proper comprehensive supplier report card that includes financial and cyber data. Measuring the effectiveness of a security program can be a challenge for most organizations. After all, when you do everything right, nothing happens. No email outages, no denial of services impacts and no data breaches. Measuring nothing doesn’t really tell you much, and it certainly doesn’t give you insight into where you’re still vulnerable and could be attacked by a malicious actor. Vulnerability Management (VM) tools have been a mainstay tool for any security program, and they generate a wealth of information about what assets are most at risk from outside threats, but the information isn’t always put to best use by most organizations. In this session, we’ll look at the common metrics mistakes most organizations make with their VM efforts, as well as more relevant and actionable metrics that will help you get a better understanding of your security posture against today’s threat landscape. User and Entity Behavioral Analytics (UEBA), when properly implemented, can be incredibly valuable: it can provide security teams with a new lens through which to detect, investigate, and respond to evolving security threats. However, there is a lot of hype in the world of AI, and not enough real use cases or concrete recommendations. This webinar aims to help correct this, with real world use cases and learnings from the past five years of deployments at Interset. Global cybersecurity analyst Liviu Arsene will discuss how advanced threat detection and visibility into the overall cybersecurity posture of an organization can help prevent data breaches, by placing under the scope some of the most recent and notorious data breaches and cyberattacks. As cyber attacks become increasingly common, it is vital for organisations to be armed with the most effective tools and knowledge to prevent, detect and respond to cyber threats. This channel features presentations by leading experts in the field of information security. From application, computer, network and Internet security to access control management, data privacy and other hot topics, you will walk away with practical advice for your strategic and tactical information security initiatives.